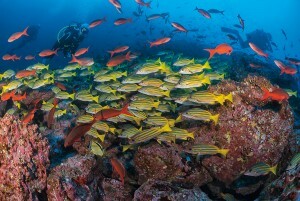 The Eastern Pacific Ocean of Central America, teems with marine diversity. 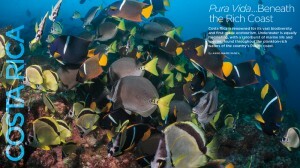 A live-aboard-yacht adventure to Caño Island (Costa Rica) and Coiba Island (Panama), offers a short but potent double dose of fun and incredible encounters with so many species. 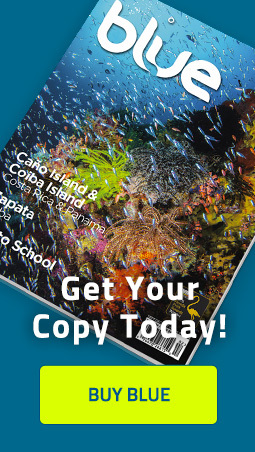 The Galápagos Islands is an ecological wonderland, well-known for its numerous endemic species, as well as those that have adapted to life in these oceanic islands of volcanic origin. 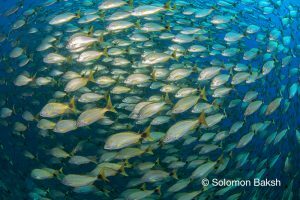 Marine life is as fascinating as the land-based animal and plant species; all mixed together and kept in balance, by various ocean currents and winds. Jardines de la Reina, Cuba, is an archipelago, just south of Jucaro town and out in the Gulf of Ana Maria. 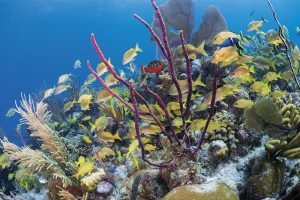 With hundreds of cays and mangrove islets, the area has a thriving fish population, with the guarantee of seeing numerous sharks and groupers. 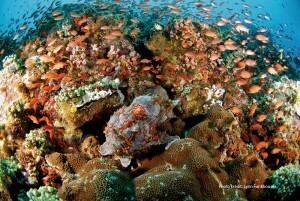 Raja Ampat, Indonesia is the global nucleus for marine diversity and part of the renowned Coral Triangle in Asia. 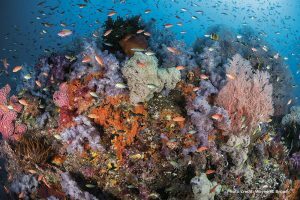 Here, the reefs are resplendent with colorful sponges and corals, vivacious fish and spectacular subjects for macro photography. A perfectly camouflaged frogfish, sits atop the reef at Kirby’s Rock, Anilao, Philippines, while bright, orange anthias swim around. 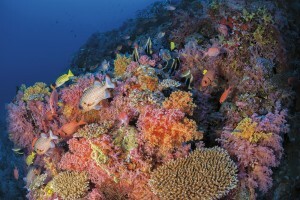 The Pinnacle is one of the most colorful dive sites in the north of Guanaja. The top starts at 55 feet and drops to a sandy bottom at 135 feet. 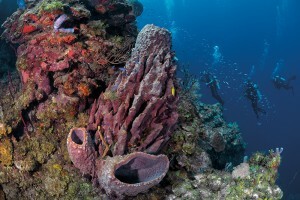 It is completely covered with black corals, gorgonians, tube and barrel sponges. 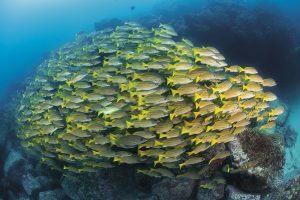 Golden Wall at Vaavu Atoll, has breathtaking reefscapes that are covered in an abundance of colorful corals including orange, magenta and mauve spiky soft coral as well as thousands of kaleidoscopic fish species.